SW Limousine provides quality airport transportation services for business, frequent travelers and families. Our professionally trained chauffeurs are knowledgeable and familiar with all Arizona airports. Our dispatch team monitors all flight arrivals, departures and gate information to communicate any travel changes to our chauffeurs. Whether you are traveling alone or with a group, SW Limousine will get you to your destination on-time with a smile. Visit our Rates page to see our set Indianapolis Airport Transfer Pricing. You can always call us to get a current quote. At SW Limousine, we understand the importance of professionalism and Airport standards. Our commitment to quality service and meeting the individual needs of each client is key to our success. 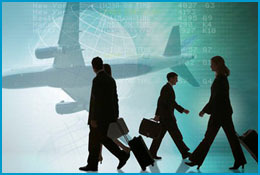 For businesses that have frequent travelers we offer Airport Accounts. From conventions and meetings to airport transfers, SW Limousine is Phoenix & Scottsdale’s choice for Airport ground transportation. SW Limousine understands the importance of providing the absolute best services that the Airport VIP has come to expect. We treat everyone as a VIP and work extremely hard to make their ground travel experience one of relaxation.